Autumn. The time of changing colors, cooler weather and delectable holiday treats. But with the change in seasons comes the need to do some additional home maintenance. When the leaves start to make their descent from their timber home, they often can make their way into a house's rain gutters causing a whole host of problems. Problems such as leaks, blockages, rust, and more. ​So what can a homeowner do? How can they ensure that their home is not compromised due to faulty gutter care? By making sure their gutters are free and clear of debris, no rust has accumulated causing weak spots, and there are no leaks. ​This is often easier said than done given work schedules, physical restraints, and perhaps even a fear of clamoring up to a rooftop for all the needed repairs and maintenance. The solution? Calling up Elkhart Gutter Pros. ​Old gutter systems usually sag in the middle because a long time ago technicians used too big of nails to nail the gutters into the fascia board on the home. The metal expands and contracts in the harsh climate conditions, and over time the gutters will pull the nails out, this causes the gutter system to weaken. Some gutter companies still use those big nails instead of the new type of inside hidden gutter hangers which can be screwed into the board instead of being nailed. Gutter replacements is usually not needed to correct this problem. On new sagging gutter systems it is possible to install the hidden hangers inside them to reinforce and pitch them in proper place. We offer quite affordable gutter installation. Harsh climate conditions and storm damage usually occurs when falling trees or branches fall in the gutters during storms crushing them. During these rain storms gutter nails will pop out when the gutters are full of debris and weighed with water. In the winter season, there are low quality gutter screws that can pop out under the weight of the ice or snow. DIY gutter repair can be time consuming. Our company can save you much valuable time. Our expert techs can offer the best gutter repair tips to clients. The downspouts are the parts that serve the importance of moving the water collected by gutters completely away from the home and this part should always be efficiently repaired promptly. Just the dents or crushed section of these downspouts have to be replaced and they are inexpensive. Gutter leak repair can save your home from being damaged by water. Improperly installed gutters that do not have enough pitch for the water to flow towards the downspout can be another bad result of sagging gutters, or even when the hidden hangers are used but instead they were nailed and not screwed in. Rain gutter repair is really important for homes. ​Michiana Gutter Pros for Gutter Repairs is your best choice for gutter repair or replacement services. We offer our clients a very affordable price on gutter repair costs. We use the highest quality brand of gutters for complete gutter system replacement. 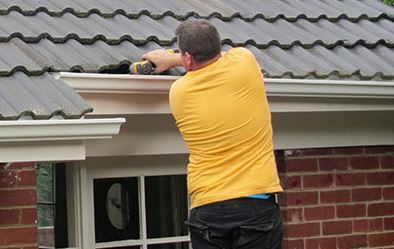 We have professional gutter installers who have been extensively trained in the field. You may contact us here or just give us a call to get a free consultation, free quote, or written estimate for insurance purposes or a gutter inspection. We offer flexible appointments to our clients. Some gutter repairs that you may need are downspout adjustments, fix leaks and cracks, unclog gutters, repair seamless gutters, and more. If you plan on DIY, then our gutter repair experts can offer excellent gutter repair tips that can save you both time and money. We offer affordable seamless gutter repair, and all of our services come with a complete guarantee. We assure our clients that they will be completely satisfied with our professional services. We are a top rated and leading company in your area who has received excellent ratings from clients who have relied on our services before. Cleaning or trying to repair or replace your gutters from the top of the roof is not recommended for your own safety. If you plan on DIY, then you should clean your gutters while standing firmly on a ladder and have someone else with you. When you are working from a ladder, you should only use one bucket for gutter debris when cleaning them, and use another bucket for carrying your gutter cleaning tools. Using wire hooks for attaching the buckets to the ladder will be much safer for you. Make sure that the area below the gutters is clear and free from objects that can cause you to trip and make you fall. We use the highest quality replacement gutter parts for long lasting durability. Rain gutter repair is provided by our expert gutter repair team. We have the knowledge to answer all of your questions and concerns about gutter repair or replacement. When you choose to take care of your gutter system right, then you will be choosing the best protection for your home. We can make your gutters look new again. When your gutters are in good working order, then they will work correctly diverting the rain water away from the home. Speak to one of our techs today and find out what we can do to help you improve your gutter system in your home. You are invited to browse our site and see what the different types of gutters that you may be interested in updating your old gutter system with. Gutters can last a lifetime if they are provided the right care and cleaning. We offer many gutter solutions to our clients to help them solve their gutter problems. Share with your neighbors what you just learned about gutters. We love educating our clients on home gutter system benefits.